What do you know about the mighty Kauri tree and its cousins, or about Kauri gum (a kind of amber) and the rush to extract this strange stuff from the swamps of northern New Zealand? The Kauri (Family: Araucariaceae Genus Agathis) is a member of a small family of trees found in northernmost New Zealand (Agathis australis), Queensland (Agathis palmerstonii and Agathis robusta) and in parts of Indonesia . In New Zealand it was originally found only in the northern part of the North Island where individual trees grew to a thousand years or more before meeting with colonial shipwrights who stripped most of the forests for spars and timber for housing. Nowadays the trees are all protected, and new plantations reach up far south of their original range, even to the South Island. Kauri timber costs a lot of money, and it has become more profitable to plant them than to cut them down. Not that cutting them down was ever easy. Probably the best kept record of the age of Kauri milling can be found at the Matakohe Kauri Museum, about 140km north of Auckland, NZ. There can be seen photographs and actual tools used by a generation of foresters who toppled the giants and then sawed planks by hand, using pits where one man stood under the bole of the tree, the other on top, each taking turns to pull the long flat saw blade through. Later the timber was transported to a mill, usually located on a river, or near the coast, for the sea was never far away from any forest. The men who cut the trees down devised ingenious ways of transporting the logs from the usually hilly terrain to the sawmills. In most cases the logs were floated or barged to the mills, but merely getting them to the water was an engineering feat. 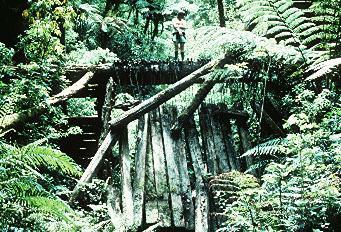 On Great Barrier Island, some 80 km east of the city of Auckland, it is still possible to see in the hills the huge timber dams that were constructed with a single key that allowed vertically placed timber skirts to abruptly swing away and release the water and the its load of bobbing kauri merchandise. The resulting flush of water transported most of the logs down to where men and machinery could drag them out to waiting coastal craft. The shape of the kauri tree was particularly useful. The trunk was straight, a wall of wood rising some 50 meters in the larger specimens, without as much as a single substantial branch to blemish the grain. Abruptly, at height, the symmetrical crown towered as high again, usually covered with forest epiphytes and ferns, and inhabited by strangely mournful birds such as the kokako, birds so removed from the forest floor that for years they were thought to be extinct, but have now been re-discovered in the same majestic trees that were already standing proudly in the mountain mists a hundred years ago. Present day kauris prefer high ground, they grow best on mountain ridges and appear to huddle together to shut out the other forest giants such as totara and rimu, trees that share the gullies and lower ridges with the pongas (treeferns). It may not have been always so; in the swamps of Northland are millions of tonnes of fallen trees, often at or below sea level. One can only surmise that once the land was higher, the sea farther out. What great catastrophe caused them all to topple? This is nowhere as evident as in the Aupouri Peninsula, that peculiar spit of sand that projects northwards at the very tip of the North Island. This is a low place, formed as a sandspit over millions of years, solidifying slowly into the long ridges of sand running parallel to the two coasts. Between each ridge is swampland, now largely drained for farming, but not without great difficulty as the low lying parts were and in parts still are a mess of tangled tree corpses, layers and layers of them. The bottom layer has the largest trees. They are monsters at least as big as the few hill-grown examples that can still be seen standing in the Waipoua Forest today. Most of them have fallen the same way, and above them is another forest, similarly laid flat, but made up of smaller individuals, while above that again is the last and smallest layer. We know this because of the gumdiggers, and the farmers. The gumdiggers came first, they sought the high-value 'gum' (amber) or resin that lay in the swamps with the bones of the forest. As with all the Agathis family, the kauri tree produced large amounts of resin whenever the tree was damaged in any way, the clear exudations dripping down the massive trunks, and down from the wind-damaged branches to lodge in the cavity formed at the crown of the standing tree. When these trees toppled the gum slowly changed over the ages, becoming a rich clear-brown deposit of remarkable beauty. Beauty was the last thing the gumdiggers were interested in. The special characteristics of this resin made it particularly useful for varnishes, and for paints, and later for linoleum, and when the newly industrialised world discovered this resource a great surge of people moved to the north to make their fortunes 'digging gum'. Tent towns sprang up, with all the characteristics of a gold rush, and thousands of foreigners moved north to 'make a quid'. As with gold, not many of them succeeded, for it was extremely hard work in water-filled swamps that quaked and flowed and in the summer burned, for the surface was largely peat and likely to smoulder for months after the seasonal scrub fires. In fact, after drains were dug and the water table lowered, burning became a common method of reducing overburden, meters at a time. Before the land was drained the gumdiggers had evolved a number of ingenious methods for retrieving the resin from the tangled masses of trees, sometimes fifteen feet (4 meters) down. Exploration was undertaken with a spear, which consisted of a long, thin rod of steel with a small circlet shrunk onto the tip, much in the form of a tightly coiled spring, and only just wider than the rod proper. The digger prodded the swamp with this spear and evaluated the solid objects he struck by feel and sound, recognising the difference between timber (logs) and gum. In addition, when the spear was withdrawn and the circlet inspected, resin or wood was trapped between the spear and the spring. The type of gum could thus be evaluated. If the swamp was too wet for digging, it was often possible to retrieve the gum with the use of a hook, another long, slender spear with the end bent at right angles and flattened slightly to make a two or three inch (5-6 cm) bill or nib. When a large piece of gum was located, the hook was pushed down into the slush and worked around underneath, then gently worked to the surface. Since most of the deeper swamps were a mass of kauri timber at all depths, great skill was required to recover gum by this method. Because the swamp was so liquid, it was quite possible to actually move the timber itself by the hook method, and sometimes two or more diggers would co-operate to if the patch of gum was large enough to be worth the sharing. Pieces of gum smaller than a mans fist were considered not worth the effort when hooking. Originally there was a market only for large, high quality gum, but as the overseas importers and manufacturers developed processes that could progressively crush and filter the raw material to eliminate wood and other contaminants, any and all gum became salable, and new digging methods were evolved. One vital piece of equipment was a hurdy-gurdy. This was a home-made contrivance that was essentially a medium sized circular metal tank whose bottom was perforated with thousands of nail-sized holes. A wooden bar was fitted across the top to support a stirring paddle that was hand cranked to stir the mix of gum, mud, sticks and water that was baled into the contrivance bucket by bucket from the adjacent gumhole. Digging the gum was only part of the story. Once it was on the surface it had to be scraped, dried, graded and bagged. On selected spots within the gumfield, special cleaning areas were constructed. These were flat, circular areas with hard packed, earth that was always above the swamp waters and was dry and hard enough to sweep with a broom. There the larger pieces of gum were scraped, and the progressively smaller chips winnowed and graded by means of a sieve. Not all gum was the same. Some was hard, glass-like material almost black in colour, while other gum was translucent, virtually clear. Yet more would be chalky, crumbling in the hands when it dried out. This latter was the lowest grade but still salable, but the digger realised the best price for his efforts if the product was sorted and cleaned. Eventually it was bagged and carried away by the gum buyer. Kauri gum is interesting material. Exposed to light it will tend to darken, while darker pieces kept away in a drawer will often become more translucent. Not all the gum acts in this way, but it is one of the characteristics that has made it valued for jewellery. No kauri gum is deliberately dug for nowadays, modern chemistry has provided much more cost effective alternatives, and in any case most of the once sodden swampland is gone, replaced by green farmland pasture or horticultural blocks. The romance lives anew, however, as the once spurned stumps and boles pushed out of the farmland bottoms have become a rich resource for beautiful wooden tables and other devices. In Awanui, some seven kilometers north of Kaitaia the Ancient Kauri World produces a wide range of items for local and overseas tourist markets. The timber is still workable after thousands of years of immersion in the swamps. Whole tree stumps are stacked outside the workshop in Awanui, waiting for the craftsmen to release beauty from something so unimaginably old. There are very few other legal sources of Kauri timber. Most significant forest remnants have been made into National Parks now, or if the trees happen to be on private land, special permits are required before one may be cut down. As with most native forests, the New Zealand bush is an integrated whole, and every tree, every shrub, every fern has its place. Remove one component and the remainder suffers. The naturally seeded Kauris stand in groves; this is partly due to the way a single parent plant seeds, and partly utilisation of particular sites, usually steep ridge faces that are not too rocky, and which have good drainage. From the air the grove is seen to project out of the background forest like mushrooms from a lawn. The bark of the NZ Kauri flakes off as the tree grows, forming a considerable pile of detritus around each trunk. These bark middens are the preferred home of an unusual kind of snail so associated with the tree that it takes its name from it. They have flat, black whorls and can grow up to 12 cm in diameter, and eat the earthworms that convert the bark into soil. These snails are not known south of the natural southern growth limit line for the Kauri, which is a line of latitude running approximately through Kawhia, just south of Hamilton. In the Aupouri Peninsula a variant of these snails exists near Cape Reinga where the hills are most likely the original island group that initiated the immense sand bar that became the peninsula. Presumably the first snails had huge forests of Kauris all the way north, but whatever catastrophe that caused the destruction marooned them and in time allowed them to become slightly different to their southern cousins. The Kauri habit of readily oozing resin had another interesting effect on the forest denizens. Insects became trapped in the sticky substance and were preserved forever, and occasionally a piece of gum will be found that has this tiny time capsule. This has been a brief look at one of the most interesting trees of the world, one which through its generous legacy of amber has made an indelible mark on the history of New Zealand, at the very least.